Mohamed Salah scored a contender for goal of the season in Liverpool’s 2-0 win over Chelsea, but Shay Given seemingly had other things on his mind. The Merseyside giants took another important step towards possible Premier League title glory with a crucial win over the Blues. Goals from Sadio Mane and Salah settled the showdown, with the latter scoring a stunning goal with a long-range effort to send Anfield rocking. 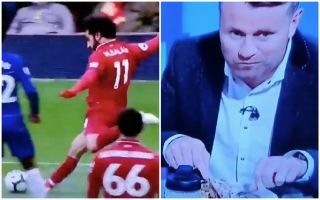 As seen in the video below though, Given was part of the punditry team for Star Sports but it appears as though his dinner couldn’t wait until after the game as cameras picked him up tucking into his meal while Ian Wright and the rest of the panel were forced out of their seats by Salah’s brilliance. We can’t quite tell what was on the menu, but fair play to the former Republic of Ireland international, clearly food comes first no matter how special the goal was!